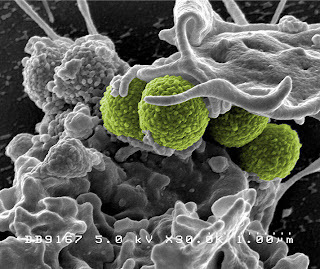 in blood infections, under attack from a white blood cell. Photo: Wikimedia Commons, public domain. A story published earlier this week on NBCNews.com both alarmed me and piqued my interest. It alarmed me because, well, I don’t like microbes much (despite, or perhaps because of my background in microbiology), and this article is about people getting very, very sick from sepsis (aka septicemia or bacteremia, an infection of the blood), which presents itself as a whole-body inflammatory response and a significantly increased risk of organ failure. It is an important area of microbiology because sepsis results from a bacterial infection, and the article says that 20% to 50% of infected patients die from sepsis. My interest was piqued, however, because the piece goes on to talk about how a new genetic testing device that the US Food and Drug Administration approved in June could possibly help rein in the disease. That’s because it can reduce the time for diagnosing sepsis from days to hours. And when it comes to sepsis, time is critical. A 2010 study in the journal Critical Care Medicine found that for every hour of delay in administering antibiotics, mortality rose by 7.6 percent. About the size of a small microwave oven, the Verigene Gram-positive Blood Culture Nucleic Acid Test is the first system approved by the FDA to identify quickly certain bacteria responsible for bloodstream infections -- and whether some are resistant to the top drugs used against them. Instead of the three days required for a traditional blood culture panel, results from the Verigene test come back within three hours, identifying up to a dozen specific bacteria known to cause sepsis, including strains of Staphylococcus, Streptococcus, Enterococcus and Listeria. Of particular importance, the system can catch some particularly nasty bugs, methicillin-resistant Staphylococcus aureus (MRSA; see Maryn McKenna’s excellent Superbug if you really want to terrify yourself on this subject) and vancomycin-resistant Enterococci. The test is remarkably simple, and even automated, requiring a dedicated sample processing instrument and a reader from Nanosphere. The patient sample is added to a glass slide covered with capture signals that recognize DNA from sepsis-causing bacteria. The capture signals are placed on the glass slide in a defined order, each programmed to recognize only one strain of bacteria. This uniform order helps scientists identify which strain of bacteria, if any, is responsible for the infection. If the patient blood sample contains bacteria, the signals on the glass slide will capture its DNA, and the special scanner and software can detect this capture. What sets the Verigene test apart from the previously available tests for sepsis is precisely how they do the detecting. The test adds sub-microscopic gold balls, called gold nanoparticles, to the glass slide. These gold nanoparticles are studded with more capture signals. When bacteria match up with the same specific capture signals, the nanoparticles will attach to that area. 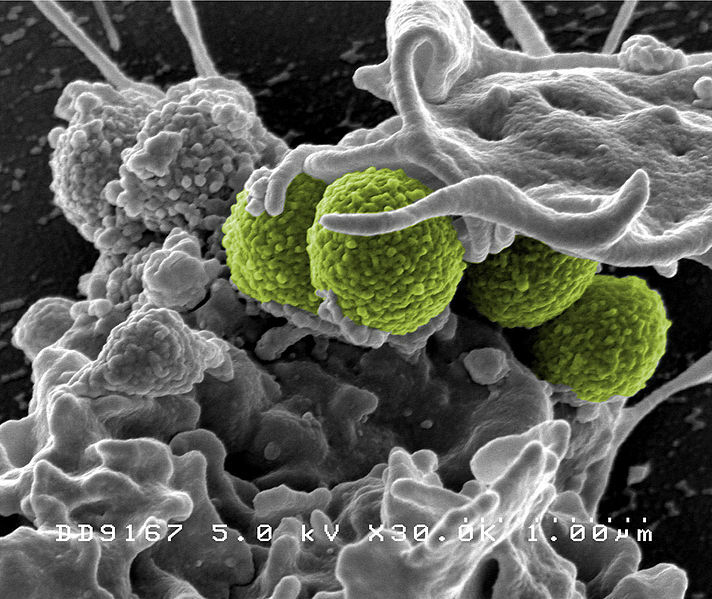 This ball gives scientists the ability to more rapidly detect which type of bacteria, if any, is present, and thus select the right course of antibiotic treatment. The reaction is developed by coating the gold nanoparticles with silver, a process called signal amplification, which increases sensitivity up to 100,000 times, and then hitting it with light. Those spots containing the nanoparticles scatter light; those without it, do not. The effect is so strong, the original paper detected it using a “conventional flatbed scanner,” like something you’d have in your home office. According to Nanosphere’s website, the whole thing requires less than five minutes’ worth of hands-on time, plus 2.5 hours to get the result. That falls within the necessary time frame to diagnose sepsis and begin life-saving antibiotic therapy. Hopefully, this is a technology that neither your family nor mine will ever need. But it's nice to know it's there. And now, you know how it works.